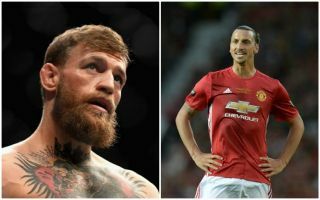 UFC star and celebrity Manchester United fan Conor McGregor has sent a stern message to Zlatan Ibrahimovic. In an intriguing interview in which he shares his views of Juventus superstar and Red Devils legend Cristiano Ronaldo – a player he’s a huge fan of – McGregor did find a moment to aim a sly dig Ibrahimovic’s way. The outspoken Swede, who is now at LA Galaxy after a year and a half with Man Utd, is known for being one of the biggest characters in football, but McGregor isn’t convinced by this persona. The Irishman has been quoted in the Mail as saying he believes Ibrahimovic is trying a bit too hard to be the Conor McGregor of football, but somewhat sarcastically wished him luck in trying to achieve that. ‘I respect Zlatan and his positive-winning-mentality mindset, but let’s get this straight: there is only one Conor McGregor!’ he said. One imagines Ibrahimovic will have some witty response of his own to this dig, and we eagerly await what could be an intriguing battle of words between the pair.